Yotaan has finally started playing WoW regularly again, but a bit too late. Fussypants achieved the cloak first on Monday, finishing her year long journey. Fussypants: Yay!! I just wanna say a quick thanks to all the people who stayed in my celestial group for all 4 bosses! With the advices of commenters on WoW Insider and the help of Other Raids, we got it done in under an hour. Woot woot!!!! Now that I’m done on my mage, I’m turning my full attention to my paladin. So far, I’m at 8/20 Secrets of the Empire, and no trillium bars. And it begins again! How far are you on the legendary questline? 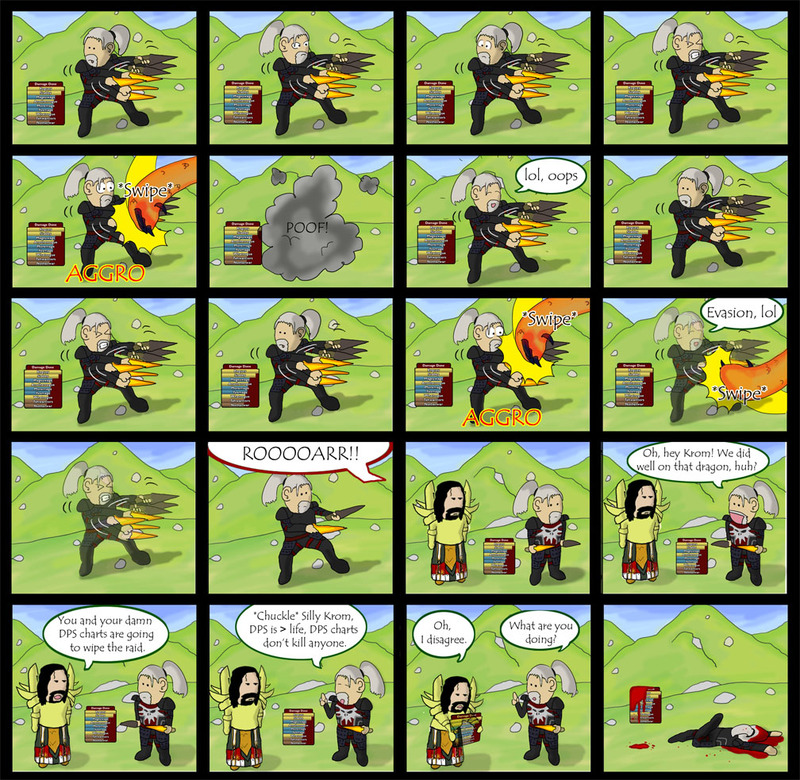 Comic from the Dark Legacy Comics! So, I have a conundrum. And it has to do with addons. I don’t use them. I don’t have a single one installed. I raid without DMB, use the basic UI, and use the basic auction house layout. But this would be my first addon ever. This brings me to my conundrum. Should I download a meter and feed my vanity, or remain pure and not download one? The reasons why I would are simple; I would know how good my deeps/heals are compared to others, and find ways to improve myself. I would have that knowledge, satisfying my curiosity regarding my output. There are many reasons, however, why I should not download one. For starters, this would be my first addon. I would go from being ‘pure’ to relying on addons to play the game. I have a sense of pride for being able to play as well as I can without addons (other people who don’t use addons may feel the same way). And I would essentially lose that specialness. The more important reason is that I would probably become one of those people who can’t get their eyes off of the meter. I would be so worried about getting to the top that I wouldn’t move for bad, or worry about aggro. I think the comic at the top from Dark Legacy Comics perfectly describes me. So, I’m asking you guys, meter or no? Last Saturday, I did it. I finally did it. I raided. Not LFR, but real flex guild raiding. We struggled with having enough people almost the whole time, never had enough healers, and didn’t even manage to down the first boss. And it was GLORIOUS! The night started with the installing a voice communication system on my laptop. I was super nervous about talking to other people, even though I knew everyone pretty well. My fears were, of course, unfounded, and I soon grew to enjoy talking to the people in my guild instead of typing. After troubleshooting for a little bit, and finding out that my head set was busted, I was all set to go. We spent about an hour recruiting enough people for the raid, and then we were set. I managed to get my dad to join, so he was raiding with us too! We all queued up, and zoned in. 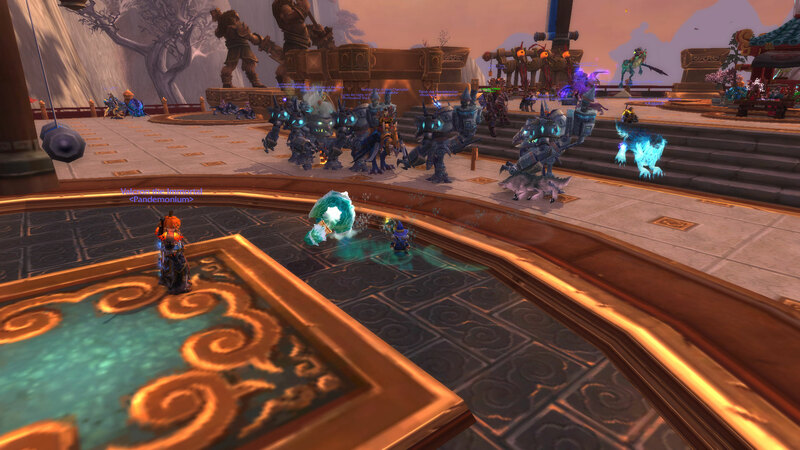 None of us (from the guild) had ever flex raided before, but everyone knew basically what needed to happen. 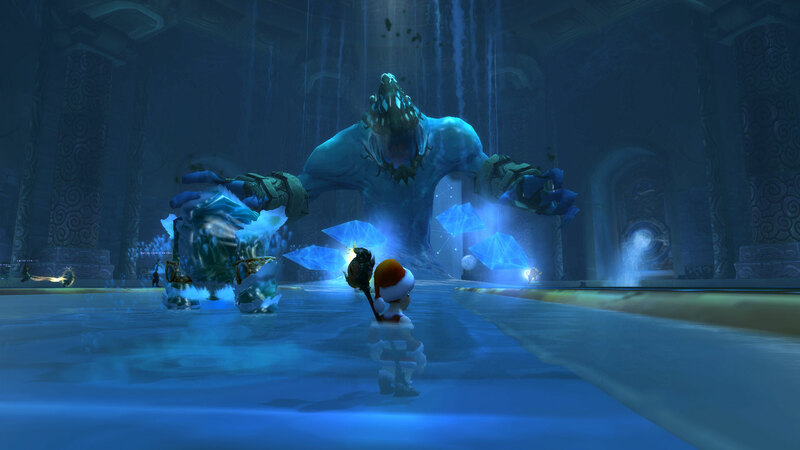 We had some issues with the trash before Immerseus, but soon found ourselves at the boss. A quick pull later, and everyone wiped. It was spectacular. Happily, everyone was in high spirits, so we brushed ourselves off, and got up to try again. A few tactic changes later (thanks to an incredibly helpful draenei shaman), and we were at it again. And we wiped. We managed to get to the splitting phase, but we didn’t have the heals to cover all the blobs, or the dps to kill them all. The night progressed, and we wiped many more time, but everyone remained in a good mood. At one point, we had a party, and everyone pulled out their fun items. All throughout, everyone was having a fantastic time. But all things must come to an end, and after 3 hours, I had to go to bed. I really loved the experience. It was fun, not at all stressful, and suitably challenging. For a first experience with raiding, I couldn’t have asked for a better one. I loved hanging out with people and having a good time trying to figure out how to down the boss. Even though I never saw Immerseus fall, I didn’t need to. I had a fantastic time. And I fully plan on raiding again next weekend! Over at WoW Insider, they have a column called Community Blog Topic, which is a chance for the opinions of other blogs to be gathered and published on their site. This week, the question they asked was “Pitch Your New WoW Class”? Fussypants and Yotaan blogged their answers here! Fussypants: This was a hard one! I’m of the mindset that WoW has all the classes it needs, but if I were able to make a new one, I’d probably add a modified allomancer (ha ha, guess what I’ve been reading 😉 ). The Allomancer Class would manipulate the metal that surrounded them. Abilities would include Metallic Push (Pushes against the metal on the target, knocking them back), Glinting Pull (Pulls the metal on the target, pulling them towards the caster), and a class specific ground mount (Alloy Dragging, the caster infuses themself with the power of metal, allowing them to run very fast) and flying mount (Gravity Lapse, the caster pushes against a nearby metal, shooting them up in the air. The caster continues to bounce from metal to metal). The class would wield daggers, fist weapons, swords, and staves. The Steamworker uses the power of steam to help in their attack and defense. This is not an magic elemental approach but rather a mechanical one. Obviously, the engineering profession would dovetail quite nicely with this class. ⦁ Tin Man: Melee DPS that relies on slow steam powered melee attacks. The tin man swings slow, but hard. Can duel wield, but only maces. The class would wield maces, shields, polearms, staves, and rifles. So what class would you create? NOTE: Fussypant’s class is based off of Allomancers from the Mistborn Series (She suggests you read it). She does not claim the idea to be her own. When thinking about the upcoming expansion, Warlords, my thoughts turned to my and Fussypants’s stable of toons. We have a lot! Now most of them are low to medium levels, but several are 90’s. They are of a few different classes. More importantly, we have nearly every profession covered, and they are all max level. Only blacksmithing lags behind, but that’s mainly due to time. I’ll get that one up to max level as well. So why all this alt talk? I am hoping that Blizzard will not only make the new expansion alt friendly, but also encourage synergy between the alts. We are starting to see that a little already. Heirlooms were the first step. They were designed from the beginning to encourage players to make more toons alongside their main. 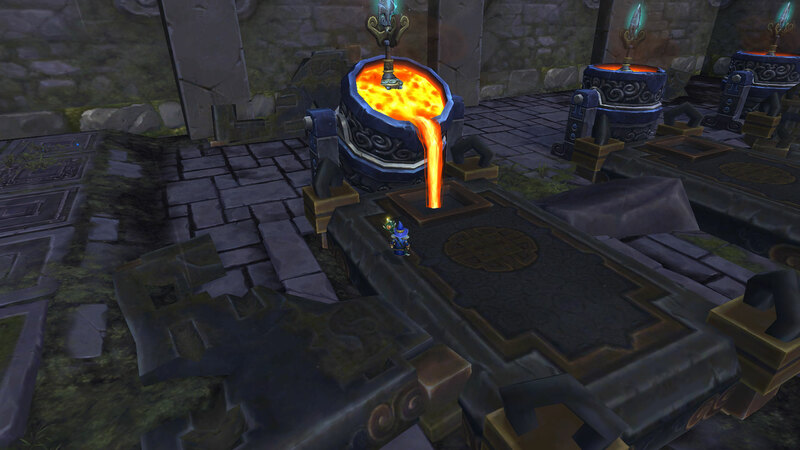 Heirlooms also were designed to be shared amongst the alts as well, being account-bound. Account-bound items were a brand new idea and, I think, the first step by Blizzard to promote synergy between alts. Now, most players with alts, if they have any interest in professions, will have different profs for different toons. This has been the case for a long time, long before the introduction of heirlooms. For us, Fussypants can make the flasks for the alts and Yotaan can produce the leatherworking leg enchants. Blizzard began to make this even easier when they introduced immediate mail delivery between characters in the same account. Without needing a guild, our toons can farm or produce many different kinds of items and nearly instantly mail them to the other toons in our account. So now we have another kind of synergy. So, what do you think? Should Blizzard expand this idea and promote more synergy between alts? Would Garrisons be the answer? Every once in a while, I see something that is so out of the ordinary and so quirky that it just bring a smile to my face. Recently, it was the antics of the players at the Shrine of the Seven Stars. I was there with my dad while we waited on a raid queue, when I happened to wander outside. And I was met with this. It turns out, some people had decided to get on their Sky Golem and slow walk in a line around the Shrine! It was so strange and surreal, that I had to join. So, for about 10 minutes, me and 15 other people solemnly marched around on our mechanical monsters. Eventually, I had to go, but that had to have been the coolest and most spontaneous thing I’ve seen this year! Working on the legendary questline. 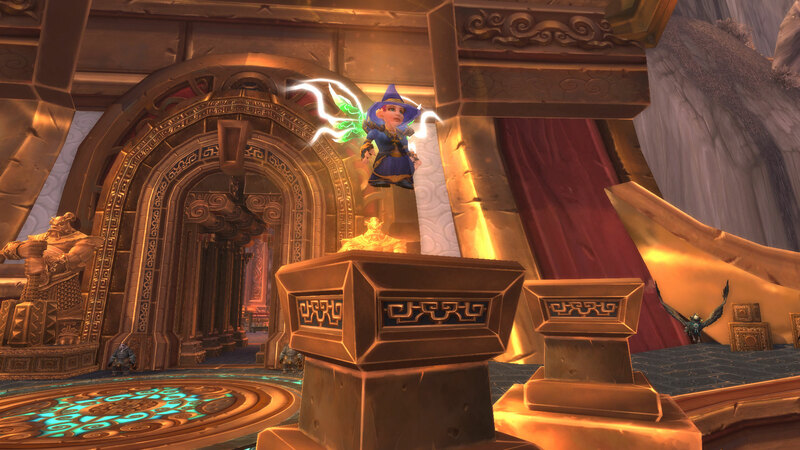 Over at WoW Insider, they have a column called Community Blog Topic, which is a chance for the opinions of other blogs to be gathered and published on their site. This week, the question they asked was “What are your WoW New Years Resolutions”? Fussypants and Yotaan blogged their answers here! 2) Finally get around to leveling my feral/resto druid. 3) When WoD finally rolls around, I want to try to stick with one character to get to max instead of burning out and leveling alts. I have yet to do this my entire WoW career. 4) I was inspired by some of the commenters on WoW Insider, so now I’m gonna try for every mount in the game that I don’t already have. I am surprisingly far along with this. 4) Get more reps up on Yotaan, he’s the toon with the most exalted reputations. 5) Write more in this blog. Fussypants has offered her views often, and it’s time for more contributions from a father’s perspective. 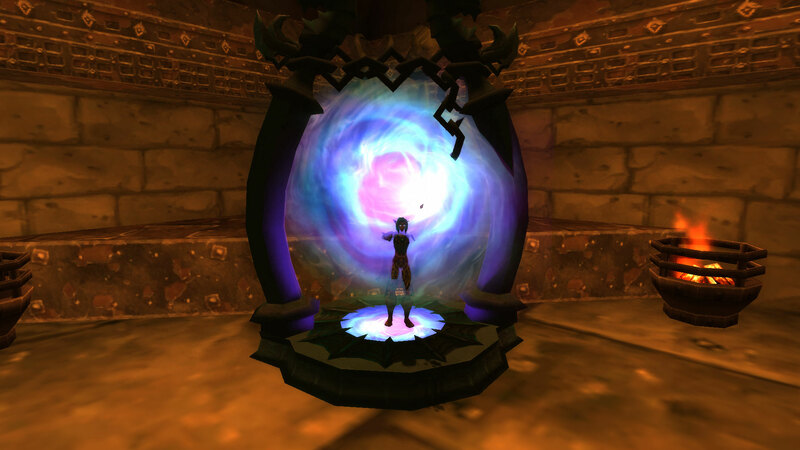 Tell us, intrepid readers, what are your New Years resolutions for WoW?